I’m not sure why human beings want both sides of an object to match each other in every particular. That desire may be encoded in our DNA. After all, nature designed the animal and plant kingdoms to have bilateral structures. At least on the outside. Nobody actually looks like Jacqueline Roque (whose picture is posted with this blog) in real life. All the same, I’ve come to love the way my two halves don’t match. My left eye is smaller than my right, and my right eye has a smaller lid than my left. My left lid droops a bit over my eye, too, especially when I’m very tired. My left breast is almost half the size of my right. My nursing babies were not as happy with it – perhaps it gave less milk. My left foot, now that I am no longer so young, is aging more quickly than my right. Its toes curl a bit, and it’s falling apart (literally), whereas my right foot looks as youthful as ever. The age old prejudice against the left side makes me feel protective of my less idealized left side. The words “gauche” and “sinister” – coming directly from the French and Latin words for “left” – diminish the quirky loveliness of the “other” side. Not many people comment on my asymmetry. Though noticeable, it does not scream “FREAK!” I have had many men find me beautiful and desirable, something I have always enjoyed. As hard as I can be on myself and as difficult as the aging process is for me, I have always found myself striking to look at and, since my youthful and highly insecure years, have embraced my lack of mirror imagery. Funny story. Once, a doctor said to me upon doing a visual exam of my breasts prior to the more painful, but much less awkward, touch exam – “Did you know your breasts are not the same size?” His voice was a bit shrill and he sounded quite taken aback. A medical professional no less. Seriously? I am unique! Maybe one side is my “best side” and one isn’t. Maybe I’ll dedicate the two sides of myself to science. I’m not quite ready for the freak show, mind you. 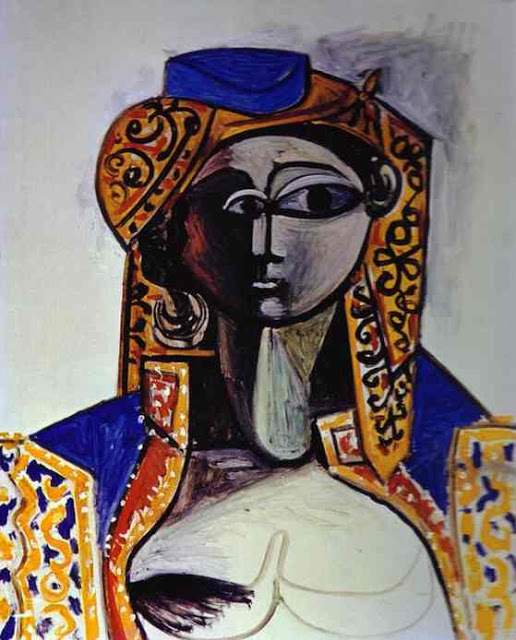 Just a quirky Picasso-esque woman with two of everything. This entry was posted in body, mind, soul, social commentary, Uncategorized and tagged mirror image, Picasso. Bookmark the permalink. Your posts frequently align with my life. I picked up my new glasses last night, and as usual, aligning them to sit evenly on my face took eons. My ears are not symmetrical and neither are my eyes, making me a challenge for every optician lucky enough to help me. Symmetry is vastly overrated. It’s so much more fun to be crooked. I JUST got my new glasses yesterday — Thursday — and the guy straightened them so they lay flat on the table and when he put them on my face — no dice. He had to warp the hell out of them for them to look right on me. So funny that we just had the same experience! I rarely get glasses since I wear contacts — probably because having glasses work on me is difficult. No, it’s because I’m vain, let’s face it. But I depend on them once the lenses come out as I am blind as a bat, sans the sonar.